In terms of disability type, 14% are pain-related, 7% relate to flexibility issues, 7% are mobility difficulties, and 7% are mental health-related. Luckily, there are insurance policies in place that can protect you: some come with employment, some can be purchased on your own, and some are automatically in place through your federal and provincial government. The whole disability topic is somewhat complex, although this should not be the case. We have not seen a good explanation of the entire disability system, so we decided to create this article. In general, disability insurance is an insurance type that protects you if you become disabled and cannot earn income any more. In this case, disability insurance pays you a share of your usual income, either until you are healthy or until the end of your disability coverage. Disability insurance claims can last as many as multiple years, or even until your retirement. Please note that not all disability insurance types apply to all situations – sit tight: we will explain each of the insurance types below. We thank a recognized insurance expert Richard Parkinson for his support in compiling these insights. In short, anybody who earns income through the completion of some kind of work should consider disability insurance. Given the fact that many people live from paycheck to paycheck, it is very hard to digest a loss of income unless you have huge savings. In general, disability insurance covers a loss of income due to an injury, accident any other unlucky development. Different types of disability insurance cover different accident situations (e.g. WSIB insurance would cover work-related accidents/injuries whereas disability insurance from private insurers would cover accidents/injuries that occurred both during work and in off-work time). If you are thinking about the amount of disability insurance you need, you should think about how much money you would need if you were to lose your current income due to an accident/injury. Insurance providers will link your disability benefits to the income you were earning prior to the accident. Benefits as a percentage of income: It could be any number between 50% and 85% of your current income. Beware that many disability benefits are limited, to a typical maximum of 85% of gross income. Benefits cap: This is the maximum amount you can collect as benefits. Let’s say you are making $9,000 per month: an insurance provider can cap your benefits at $5,000 per month. For most plans where you pay the premium, the benefit is tax free. Length of benefits: That is how long your benefits are paid. Often, it is until you can return to your work or until you reach a particular age (e.g. 65 years old, when you can apply for retirement benefits). 4Waiting period: In most cases, benefits payments do not start immediately, but rather after a specified length of time, called a waiting period. In some cases, it is just a few days (e.g. for short-term disability), but it can be longer in other situations. A popular choice is 90 days, so consider if you have savings to cover this four months before you receive your first cheque. What are the different disability insurance plans? As mentioned earlier, there are several disabilities plans, as shown in the picture below. Please remember that not all of them can protect you at the same time–each of them is there for a particular situation. 1Individual disability insurance is an insurance policy that you can get on your own from an insurance company, insurance broker, or financial advisor (if he/she is licensed to sell it). This is often a MUST for employees of small companies that do not offer group insurance/group benefits, or for self-employed individuals. In some cases, employees of companies that have group insurance still choose to buy individual disability insurance to “top-up” group insurance benefits (with some limitations). If, let’s say, Mary has a group insurance policy that offers 50 per cent of lost income benefits, Mary can decide to buy an individual disability policy that, in case of her injury/accident, will make up some of the rest of her lost income. 2Group disability insurance is often a part of employee benefits. You automatically receive this protection when you sign your employment contract, and it is often bundled with group life insurance and group health insurance. It is important, though, to understand how much coverage this insurance offers, and to know that it protects you only as long as you are working in the company. The coverage ends if you leave the company, and it is typically not transferrable. In most cases, group disability will stop paying benefits after 24 months if you are able to perform ANY occupation. These plans can also have a limit (called “No Evidence Maximum”) defining the maximum amount you would receive. In some cases, in order to go above this limit, you will need to qualify medically. What is WSIB and other Workers’ Compensation Boards? 3WSIB – Workspace Safety and Insurance Board (WCB-Alberta in AB, WorkSafeBC in BC, etc.) is a protection that covers accidents/injuries that occurred at work. It DOES NOT cover you if an injury or accident took place outside of your workplace. Not all companies have WSIB benefits (and other Worker’s Compensation Boards in other provinces) in place. For some industries, such as construction, WSIB coverage is mandatory; others, such as banks, travel agencies, computer software developers, trade unions, etc., do not have to have it. Also, many small companies and start-ups will not have this coverage. It is important to know that this coverage eliminates the right of employees to sue their employer as it is a “no-fault” insurance. At the end of the article, you will find the full list of Worker’s Compensation Boards listed by province. How does mortgage disability insurance work? 4Mortgage disability insurance is a type of insurance that covers ONLY outstanding mortgage payments if you can not make them due to an accident or injury that has left you temporarily or permanently disabled. This product is often sold by banks (although many insurers sell it as well) and is criticized by many insurance specialists because it is a quick sell that is based on “a fear that something bad will happen to your new home” when you purchase your property. People are quick to jump into buying this product without understanding its details. Another danger with this product is that it pays benefit for a maximum of 2 years, regardless of whether you continue to be disabled. It typically expires at age 70. Rather than buying mortgage insurance that will cover ONLY mortgage payments that you can not make due to a disability, it is better to get a proper individual disability insurance policy that will cover ALL your expenses that you can not cover due to your disability. 5EI (Employment Insurance) is a program that provides for a person who has lost his/her job or is unable to work (through no fault of their own, meaning that the person has not resigned on his/her own but, for instance, was fired) with payments during a defined period of time. EI (Employment Insurance) sickness benefits can be paid to those who cannot continue working because of health-related reasons, such as sickness, injury, or quarantine. The maximum coverage limit for EI sickness is 15 weeks. 6CPP disability is a Canadian Pension Plan disability pension that is paid to people who contributed CPP payments during their career. These benefits are typically auto-deducted from your wage/salary, similarly to EI (employment insurance). It is similar for QPP – Quebec Pension Plan, which is in place in the province of Quebec. Children’s benefit: You can get them if you have dependent kids and already receive a CPP disability pension. CPP post-retirement disability benefits: Benefits that are available to those who are no longer eligible for a disability pension because they were getting it for longer than 15 months. How much does CPP disability pay? Canadian Pension Plan disability pension pays on average $971.23 per month; its 2018 monthly maximum was capped at $1,362.30. The total amount you receive is calculated as $496.36 + an additional benefit (retirement income x .75) that is based on how much you’ve contributed to CPP throughout your career. 7ODSP – Ontario Disability Support Program is a provincial program that represents long-term disability coverage for Ontarians who are disabled/who needed financial support when they became disabled. It provides finances to help pay for food, the roof over your head, and other living expenses. This program requires proof of financial situation to demonstrate that you are in need. How much does ODSP pay? The amount paid by ODSP varies based on the number of dependents you might have, if you have a spouse, and if he/she is disabled as well. A number of other variables are considered as well. As an example, basic needs payments for a disabled person who has a spouse is $969 per month. Basic needs payments for a disabled person who has a spouse and two dependents of 18 years or older is $1,230 per month. This is clearly not enough to cover all needs and expenses. So how do disability benefits work together? Despite the fact that there are so many different sources of disability benefits, most of them can not be received at the same time (this concept is called “Integration of Benefits” and it limits the maximum income from all sources). Further, your benefits depend on your situation (what type of job you have, what coverage your employer offers, etc.). Please find below the four most frequent situations. The main coverage is shown in solid green, and auxiliary benefits sources are shown with a dotted line. If you are self-employed, your best bet is individual disability insurance as you do not have access to group disability insurance (since you do not work for a company that offers group benefits). You can still qualify for CPP-D (CPP disability benefits) because you contribute to CPP as a self-employed worker. If your income is particularly low, you can sometimes apply for provincial programs, such as ODSP. As a self-employed worker, you might also have access to EI sickness benefits, if you paid into them. Most employers will offer some kind of group benefits, but there may not be a group disability plan. Some employers (e.g. very small companies or start-ups) might not offer any group benefits. In this case, your best bet is individual disability life insurance. 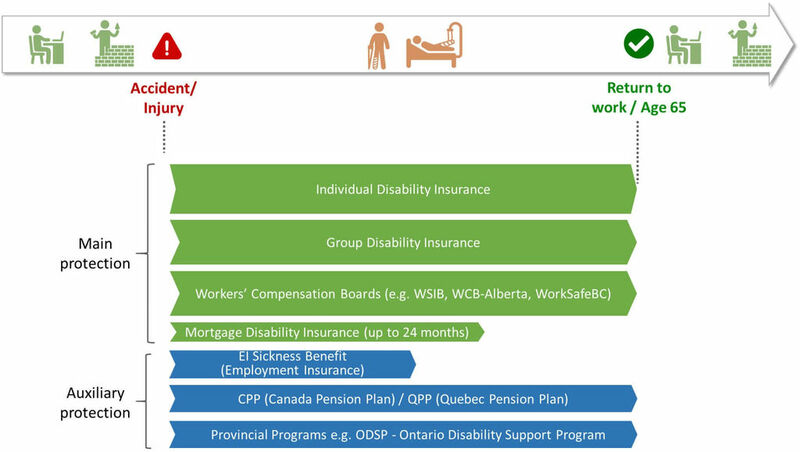 Because you are employed, and your employer has to pay EI and CPP contributions, you will have access to EI sickness benefits (if you fulfill the conditions) and CPP Disability benefits (CPP-D). If your income is particularly low, you can sometimes apply for provincial programs, such as ODSP. If your employer offers some disability coverage, it is great. In general, there is a difference between short-term and long-term disability coverage, but we look at that in detail later in this article. For now, let’s assume you have both from your employer. In this case, group disability insurance may be a good option but given its limitation (e.g. maximal length of benefits is 24 months), it is important to discuss your needs with a licensed life insurance agent. E.g. if its limits are not enough, you can decide to complement it with individual disability insurance. At the same time, you might have access to CPP disability benefits, to EI sickness benefits (if you fulfill the conditions) and, in cases of low income, to some provincial programs (e.g. ODSP). Many industries are protected by WSIB coverage (it is even mandatory for some, such as the construction industry). In this case, your main disability benefits source will be Workers’ Board Compensation (e.g. WSIB). Your employer can also offer some sort of group disability insurance, and finally, you also have an option to get an individual disability insurance policy, although it might be overkill. You still can get access to CPP disability benefits, but not EI sickness benefits. Strictly said, you can receive them, but you will have pay them back once WSIB coverage is in place. You will, mostly likely, have no access to provincial programs, such as ODSP in Ontario, if you are getting WSIB. Some Workers’ Boards (e.g. WCB in BC) are notorious for denying claims or delaying for months or years before paying. In some waiting times for WCB to start paying are as long as 2 years. Short-term disability refers to the short-term disability benefit of an individual or group policy from an insurance company (e.g. Manulife, Sun Life, Great-West Life, Blue Cross, etc.) and to the short-term disability aspect of WSIB coverage – see the picture below. AShort-term disability insurance, as a part of an individual or group insurance policy, typically “kicks-in” a few days after an accident/injury (e.g. 1-7 days) and is put in place for up to six months. After that, if a policyholder has not fully recovered and is not able to return to work, the disability case will be “converted” into a long-term disability case. That might include a closer assessment via an insurance company on how a disabled policy holder might be helped to recover faster. In many cases, the person who handles the case will be changed and the case will be transferred from a short-term disability case manager to a long-term disability case manager. Some group plans do not offer short-term disability because they defer to EI, as the discount offered by insurers to the employer are not worth it. BShort-term disability, as a part of WSIB coverage, typically goes for 12 weeks, during which time the disabled person might receive up to the full amount of earnings that were earned just before the workplace accident/injury. It is important to mention that it is up to your employer which disability benefits will be offered. Some employers offer only short-term disability benefits; others might also offer long-term disability benefits. Some do not offer any. Long-term disability coverage starts once short-term disability coverage is over (e.g. often after six months). 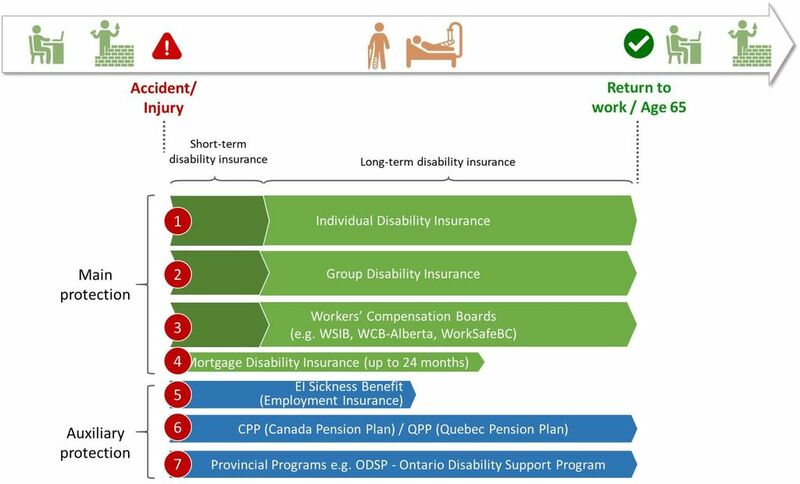 Similar to short-term disability, long-term disability can relate to an individual or group insurance policy or to WSIB coverage – see below. CLong-term disability that is offered through an insurance company can cover you for numerous years, until you are able to return to work, or until a pre-defined age (often 65). DIt is important to know that every long-term disability insurance policy will have an elimination period—that’s the period of time after an accident/injury during which you need to stay disabled and self-insure (cover your own expenses) in order to qualify for benefits. Often this period of time is defined as 0, 30-, 60-, 90-, 120-, or 730 days. The shorter the elimination period, the higher the insurance premiums. Some disability insurance products targeted at the trades offer a zero-day elimination, e.g. IA Excellence and Edge Benefits. In the context of WSIB coverage, long-term disability insurance means that your long-term earnings need to be recalculated (most likely, they will differ from the short-term earnings that you can count on during the first 12 weeks). Elimination period: It is time during which you are NOT RECEIVING any benefits and “need” to stay disabled in order to qualify for long-term disability benefits. The length of this period can vary (e.g. between 0, 30, 60, 90, 120, or 730 days). An insurer uses this time to “make sure” that it is the case of long or permanent disability, as opposed to a short-term disability (e.g. broken arm). It is a good idea to ensure that, during this time, you have enough funds to pay all your expenses if you do not have other sources of income (e.g. EI, WSIB, etc.). Long-term disability benefits payments: This is the time during which an insurer pays you a pre-defined level of benefits, which typically would represent a percentage of your pre-disability income (e.g. 60% or 70%). This can be a long period of time, depending on the disability. Typically, this period ends once you are able to return to work or when you reach a particular age (e.g. 65). End of benefits: This happens if you are able to return to work or if you reach the age mentioned in your policy (such as 65). 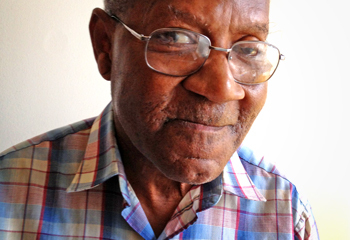 Some policies may define the maximum number of years the long-term disability can be in place. While traditional long term disability is designed to replace income from employment due to a disability that prevents you from being able to work, there is also a form of disability that will pay a monthly income based on outstanding debts, e.g. mortgage, car, line of credit loan payments. You still have to be disabled, i.e. unable to work, but with this type of coverage, it will pay the subscribed for amount based on your debts. You do have to prove that the debts are owed at claim time. The advantage of this type of disability is that it is not considered in the “integration of benefits” calculation, so if your group plan benefit would limit an individual policy, this variant may be a better choice for long term disability top-up. What is supplemental long-term disability insurance? Supplemental long-term disability insurance is simply a long-term disability insurance plan that you can get while having some coverage already in place. If, as an example, you already have group long-term disability insurance coverage provided by your employer, you can decide to buy supplemental long-term disability insurance as an individual policy. The existing coverage is not high enough: your employer offers a long-term disability coverage that only pays 50 per cent of your income in case of disability. You might want to get additional coverage to increase it, let’s say, up to 75 per cent. Attention: this type of insurance is not stackable without end –you can not have five insurance policies and “stack” them up to 200 per cent of your income benefits. The existing coverage is limited by length: your group insurance only has a long-term disability coverage in place that ends after two years using the regular occupation definition, but often ceases after 24 months when the definition changes to “any occupation” e.g. if you can make a phone call, they could say you could work in a call center so cut off benefits. You might want to consider a supplemental long-term disability plan that will extend this period. The existing coverage has a very long waiting period (e.g. 180 days). This means that, before you can benefit from long-term disability benefit payments, you need to wait almost half a year. You might want to look into policies that have shorter waiting periods (e.g. 60 days). How long does long term disability insurance last? Typically, there are three situations that define how long a long-term disability insurance benefit will last: until you are able to return to work, OR until you reach a particular age (e.g. 65 years), OR for a pre-determined number of years that are outlined in your policy (e.g. 5 years). These values can vary from insurer to insurer, or the same insurer can even offer different policies for different premiums. How much disability insurance can I get? Disability insurance payments from all sources cannot exceed 85% per cent of pre-disability income, otherwise, there would be too much room for fraud. Typically, disability payments will be between 40 per cent and 85 per cent of your pre-disability income. Please remember that, because you can be receiving disability benefits from multiple sources (e.g. 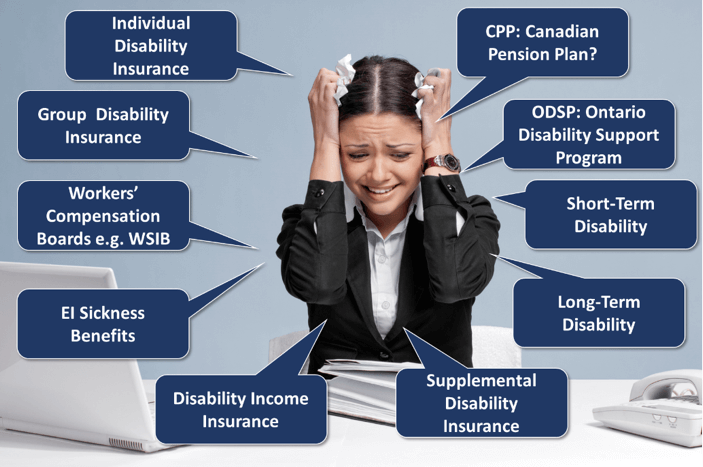 WSIB, individual disability insurance, etc. ), some coverages will be reduced to make sure that you do not get more than 85 per cent of your pre-disability gross income. We hope that you found this overview helpful. The disability insurance topic is complex, and very often, online blogs reflect only a part of this topic. Remember that it is helpful to have an experienced disability insurance specialist help you define what protection is available and needed. Our disability insurance quotes and advisory are no-obligation, and we look forward to hearing from you.